Purchaser must be over 18 to buy a handgun or rifle from a private seller in Michigan, and over 21 to buy a handgun from a federally-licensed firearm dealer (FFL). Your current Michigan Concealed Pistol License acts as a purchase permit. Because you’ve already gone through a thorough background check , a purchase permit is not required when buying a pistol from a private seller. This process is the same for both CPL holders and non-CPL licensee’s. There is no background check required for the private party purchase of a long gun in the state of Michigan. The buyer simply pays the seller and takes possession of the firearm. It is good practice for the seller to record the sale (including buyer’s driver’s license information) in case that firearm is ever used in a crime. Buyers must be residents of Michigan and seller must believe the buyer is eligible to own a rifle. If buyer makes statements or the seller otherwise knows the buyer is barred from firearm ownership, it is illegal to sell the long gun to the buyer. Michigan requires the buyer of all sales and/or transfers of pistols to undergo a background check. If you don’t have your Michigan CPL, you must get a permit to purchase from your local police department prior to taking possession of the pistol. The process is the same for both CPL holders and non-CPL holders. Contrary to private sale requirements, a person wishing to purchase a pistol from a licensed dealer is NOT required to obtain a permit to purchase beforehand. In Michigan, a person “shall not purchase, carry, or transport a pistol in this state without first having obtained a license for the pistol,” as prescribed in MCL 28.422. These licenses shall be obtained by the local police agency. If the city, township, or village does not have an organized police agency, the license shall be obtained by the county sheriff department. There is an exception for a person licensed in Michigan to carry a concealed pistol. He or she must obtain a Pistol Sales Record (RI-060) any time he or she purchases or otherwise acquires a pistol, pursuant to MCL 28.422a. Probable cause to believe that the applicant would be a threat to himself or herself or to other individuals, or would commit an offense with the pistol that would violate a law of this or another state of the United States. The Personal Protection Order must be active. Inactive PPOs will stay on file for five years for historical purposes. Unable to correctly answer 70% of the questions on the basic pistol safety questionnaire. If the purchaser is not a U.S. Citizen, an Immigrant-Alien Query (IAQ) check must be conducted through NLETS. An agency MUST wait for a response before proceeding. This could take up to three days. If the reply to the NICS check reveals no state or federal prohibitors, the license process may proceed. The applicant must answer gun related questions on a Basic Pistol Safety Questionnaire, with at least 70% correct, and swear before a notary that they meet the statutory requirements to own a pistol. The License to Purchase a Pistol form must be completed even though the applicant may already have possession of a pistol, such as through an inheritance. Federal firearms licensed dealers are not exempt from this section of the law and must also get a license any time they purchase/acquire a pistol from an individual or another gun dealer. There is an exemption only for dealers purchasing pistols directly from the manufacturer or wholesaler. If the law enforcement agency determines that the applicant is prohibited from purchasing or possessing a firearm, an NICS Guide for Appealing a Firearm Transfer DENIAL pamphlet, with the NICS Transaction Number (NTN) written on the cover is provided to the applicant. A License to Purchase a Pistol is valid for 10 days to purchase a pistol. The seller must sign the license and keep one copy for his/her records. An individual must keep a copy and return two copies to the local police department within 10 days of purchasing the pistol. Some agencies require all unused license to purchase forms be returned to them for record keeping purposes. 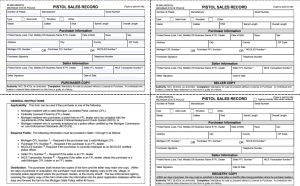 These forms are licenses to purchase a pistol and the purpose is not to circumvent the required NICS (National Instant Check System) check when buying a shotgun or rifle from an FFL dealer.